It’s 2017 and it’s time to start our deep dive into the combat mechanics of Chrono Cross. I plan to put up more frequent and shorter posts on this topic for the next couple of months, and then move on to discussing my own game’s combat. Although it’s heavily inspired by Chrono Cross, it differs in some small, fundamental ways that end up having big, interesting consequences – at least, interesting to JRPG combat nerds like me (and, presumably, you). Hope you like numbers! Stamina is the renewable resource used by player characters to perform actions. Each character can have up to 7.0 stamina. Physical attacks consume different amounts of stamina – 1.0 for Weak, 2.0 for Strong, 3.0 for Fierce – while using an Element (i.e. magic) always consumes 7.0. Physical attacks cannot be performed if the character doesn’t have the required stamina, but Elements can, resulting in a negative stamina value. A character can act as long as they have at least 1.0 stamina, so the lowest possible value is -6.0. Characters recover stamina when other party members act. Each character has a statistic governing stamina recovery; a value of 9 means that the character regains 0.9 stamina for every 1.0 spent by another character. This can be thought of as something like “speed” since the higher the value, the faster the character will be able to perform a full stamina bar’s worth of actions; scrappy characters like Kid and Pierre have recovery rates of 12, while bruisers like Zappa and Zoah have the lowest value, 8. 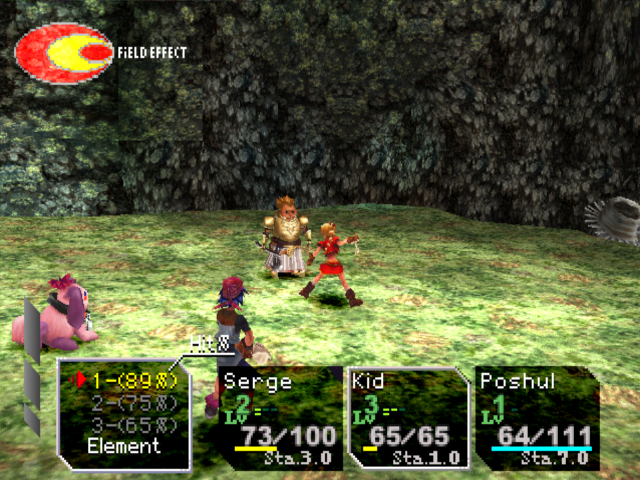 Characters also recover some stamina when defending, and when enemies take their turns; however, the equations governing that recovery are extremely opaque. It is definitely true that if all characters go into negative stamina or defend at the same time, at least one enemy will act immediately and a large amount of player stamina will be recovered; the in-between cases are hard to predict. (Check out this unusually informative thread on GameFAQs discussing the observed relationships between stamina usage, stamina recovery, and enemy actions). 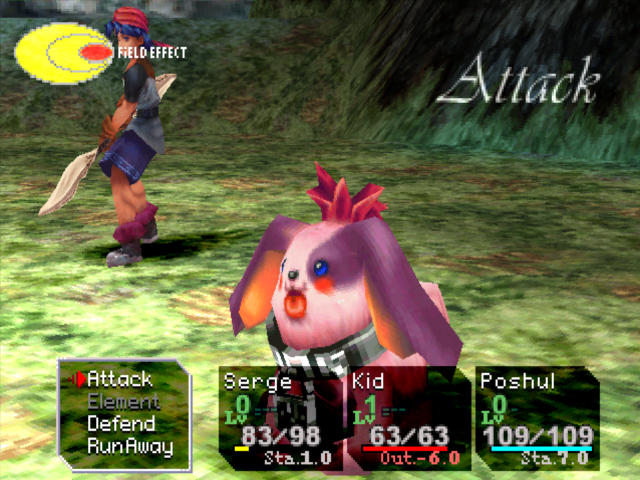 As I wrote in my very first post about Chrono Cross a few years ago, the arithmetic of stamina usage is very pleasing: attacking at each level of strength leaves the character with 7 – 1 – 2 – 3 = 1 stamina, leaving just enough to use an Element; that sequence is a sort of template for what a standard turn looks like. On top of that, if one character performs that set of actions and ends with -6.0 stamina, and the next character does the same, the first character will then have between -1.0 and 1.0 stamina (depending on their recovery rate); after a third character goes, the original character will be at or close to full stamina, ready to continue the pattern. So it’s not coincidental that the cost of using Elements is 7.0; all these numbers, plus the party size of three, fit together elegantly. What makes the combat system really joyous, though, is the freedom to creatively deviate from that pattern. You’ll want to use those attacks in different combinations and even switch characters before using their full stamina bar, because each attack affects a variety of interconnected resources besides stamina. One of those effects, Hit%, will be the subject of Part 2!